Obtaining a mortgage as a contractor or freelancer used to be a hassle. Learn about how this has changed and your options in this guide. A mortgage is likely to be the biggest financial commitment that you will ever enter in to. The process can be long and daunting, but one thing it does not have to be is difficult. Before arranging your mortgage, there are many questions that you will want answering. Of course, you can get a mortgage broker on board to guide you, but it will be up to you to make the decisions. How much can I realistically afford? What type of mortgage should I choose? How does the process work? What obstacles am I likely to come across as a contractor? These are just some of the questions that you will want answering. 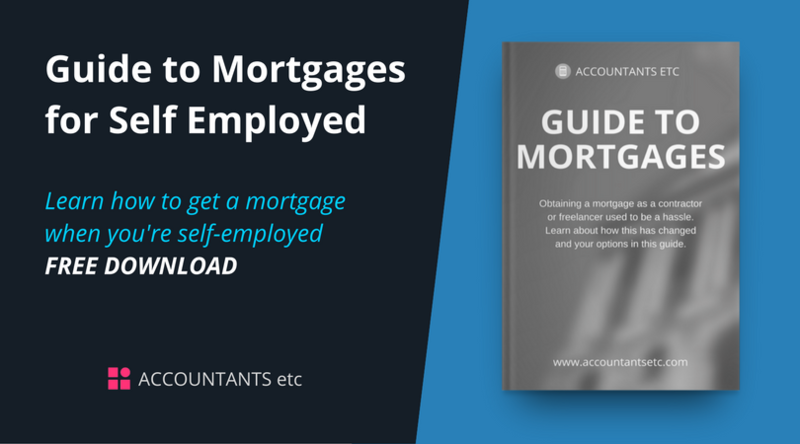 We’ve worked with our mortgage partner to create this simple guide to help you understand everything you need to know about obtaining a mortgage as a contractor. We hope that with this guide and advice from a broker, you will be in a confident position to make the right decisions for you. Getting on to the property ladder should be an exciting time for individuals. But the reality is that lenders have become increasingly strict about who they will lend to, and as a result getting a home can feel like a distant dream. There’s no point starting your property search until you have worked out your budget. All lenders will look at what income you have coming in, and what outgoings you have, including any existing credit arrangements. If you do happen to have any loans or credit cards, it is worth paying some of the debt off before applying for a mortgage, to help boost your credit rating. By keeping on top of any payments will show the lender that you are a responsible borrower. Next you will have to ensure you have enough money saved up to cover your deposit. The more you have to put down, the better range of deals you will have available to you. Deposits range from 5%, but to access the most competitive products you will need at least 10%. There are also government schemes available that help first time buyer’s get on the property ladder. The Help to Buy initiative has two distinct phases. The first phase involves the government supplying 20% deposit, while the borrower would contribute 5%. This enables first time buyers to access more competitive deals. The 20% from the government still needs to be repaid, but is interest free for 5 years. The second phase allows first time buyers to purchase property with a deposit as little as 5%. The government provides the lenders with a guarantee on part of the loan. If you are planning on relocating, the first thing you should do is look at your existing mortgage to check that you are allowed to move without incurring any penalties. If you have already reverted to your lender’s Standard Variable Rate (SRV) you should be able to switch to another deal or provider. If you are upsizing you might be planning on increasing your mortgage to cover the house. If this is the case you must remember that in order to do this you will have to apply for the mortgage in the same way you did as a first time buyer. Lending criteria has become much stricter, so although your circumstances haven’t changed, you might struggle to obtain a mortgage. And if that wasn’t bad enough, contractors find it even harder to secure the level of funding they want. A specialist broker can look at your circumstances and establish the most cost-effective option to suit your position and lifestyle. Remortgaging is not something that everyone considers, but in most circumstances the process is quick and straightforward and can essentially save you a lot of money. In addition to providing the same documents that you presented when you originally took out a mortgage, you will need a figure from your existing lender of your redemption value. Once again the new lender will want to carry out a valuation of the property to check that it is a good investment to lend on. If you are stuck on an existing deal, it is wise to research the penalties you could incur if you were to switch lenders before the deal had ended. A specialist broker can undergo a mortgage review and establish whether there is a more cost effective mortgage available, while taking in to account your circumstances as a contractor. Buy to let mortgages are a popular investment strategy for contractors in the UK. There are many lenders that offer mortgages specifically for the buy to let market. Most require at least a 25% deposit, and almost all have higher interest rates than SVRs. Is the property near shops, schools, public transport? Consider what your future tenants might be after. This way you hopefully wont be left with an empty house for long periods. How much are similar properties charging? You are not guaranteed to get the amount you set and your property its likely to rise in value in the future. It can be difficult as a contractor to secure funding for a buy to let, as lenders are constantly changing their lending criteria, deposit requirements and the rental calculations needed to be satisfied. This is arguable the biggest choice you will come across. There are many different products to choose from, each with different interest rates, fees and flexibility. All of these affect how much your total mortgage is going to cost you, and how long it will take you to pay it off. A fixed rate mortgage gives you security knowing that regardless of what happens in the market, your payments and interest rate will stay the same for an agreed period of time. There are 2, 3, 5 and even 10 year fixed deals and they all essentially protect you from rising interest rates. However, you will not benefit if rates were to fall. Once the agreed time period is over, the majority of fixed rate products will revert to the lender’s Standard Variable Rate (SVR). You have peace of mind knowing exactly how much your mortgage will cost. You have the security of knowing your payments will not rise if rates shoot up. The rate you start on tends to be higher than other products. If market rates fall, your payments will still stay the same. There are usually high penalty fees if you want to switch lenders within your fixed period. With this type of mortgage you are subject to a variable rate, except you have a cap in place protecting you from interest rates above a certain percentage. Capped options are less common in today’s market but are still offered in some circumstances. You have security in place meaning your rates will not rise above a certain limit. You can still benefit if interest rates fall. The cap put in place can often be quite high and interest payments can still reach that point. Capped rate deals tend to be more expensive than others. A variable rate mortgage can move up and down at any time, for a variety of reasons. In most cases your rate will move in line with changes in the UK economy. There are three types of variable rate mortgages to choose from: Standard Variable Rate’s (SVR), Tracker and Discount. A tracker rate follows the movement of another rate. The rate most typically tracked is the Bank of England base rate. Each product will follow either above or below, at a set margin. The length of this product can last for anything from 1 year to the whole mortgage term. Once this agreed period is over you will revert to the lender’s SVR. If interest rates fall so will your monthly payments. These products often have lower rates and arrangement fees. If interest rates rise so will your monthly payments. This type of product is the rate you revert to when your introductory period is over. Every lender has an SVR, and as a borrower you have no security as lenders can choose to increase or decrease whenever they want. If interest rates fall, it is usual for monthly payments to as well. Most SVR’s have no early repayment penalties. There is no guarantee that your payments will fall as lender’s can do as they wish. Interest rates can rise at any point. This product offers discount off a SVR for a pre agreed period of time (usually two to five years). Payments on your mortgage can still fluctuate as the lender can choose to alter their SVR at any time. However the amount you pay will always be reduced by the percentage agreed. If interest rates fall, your monthly payments will fall to. Lower monthly payments can help with the cost of moving. Your monthly payments will shoot up once your discounted period is over. There will always be uncertainty as the lender’s SVR can change at any time. When lenders assess contractors for funding, they will want to verify income by seeing two to three years worth of accounts or tax returns. Lenders have not kept up with changes in the labour market, and their criteria, in many circumstances, fails to accommodate for the growing ranks of independent professionals. Umbrella company contractors will find that many of their expenses will not be considered when calculating income. Limited company contractors will experience a similar problem, as any money retained in the company, for tax purposes, will also not count. Both ways of operating are likely to lead to a shortfall in borrowing. Let’s say you are able to overcome this first problem, you will then face another shortly after. Generally, banks and building societies only lend to those who are considered a low risk, and contractors just do not tend to fit in to this category. The reason being is that lenders worry that these individuals will struggle to afford their monthly payments when their current contract comes to an end. Presenting a case is a fundamental aspect for contractors, to ensure they are able to borrow the required funding that they need. The application has to be presented in such a way that the lender looks at the borrower and sees them as a good risk. Proving long-term income, demonstrating that the monthly payments will still be paid when the current contract comes to an end. A specialist mortgage broker can help with the process as they will have a thorough understanding of each mortgage lender and how they work. These brokers have designed bespoke contractor based underwriting with many lenders, which means contractors are able to avoid the traditional frustrations. This underwriting ensures that your income will be assessed using a multiple of your gross annualised contract rate. This figure will be used to calculate how much you can borrow, ensuring this is based on your true earnings. Essentially this means you will be able to secure a larger mortgage because the tax saving methods that use will no longer cause you to be penalised during affordability testing. The mortgage broker will be able to present your circumstances upfront to the most suitable contractor-friendly lender. Any concerns or worries about the way you work can be eliminated at the first possible instance, leaving your credit rating unmarked. To overcome the income longevity issue, your mortgage adviser will inform the lender of your skills and experience demonstrating your ability to secure future contracts. There are two essential pieces of documentation used by specialist brokers to ensure contractors avoid any issues relating to affordability. Whether you are buying a house for the first time or the third, there are other costs involved which need to be taken in to account. It is possible to add the cost of all the fees on to your mortgage but some individuals prefer to pay them outright. This is a fee the lender charges for setting up your mortgage. The amount you can expect to pay varies depending on what lender and what property you are purchasing. It could be a set amount or a percentage of the loan. This is a fee the lender charges for carrying out a valuation of the property. Its purpose is to reassure the lender that it is a good investment to lend on. The cost varies depending on the lender and the size of the property. This is a fee paid to the government on all properties over £125,000. It is paid via your solicitor at the point of completion. The cost varies depending on the price of the property. This is a fee charged by the mortgage broker. Prices will vary but it is important to ask what you are getting for your money. Be wary of brokers that charge a percentage of the loan as the amount of work involved for the broker doesn’t change much. The majority of lenders have little understanding about contractors and use procedures which are not suitable for these individuals. A specialist broker uses bespoke underwriting which enables mortgage funding based on contract value alone. Lenders have become increasingly reluctant to lend, and often a decent deposit and income is not enough to guarantee a mortgage. A spotless credit rating can decrease your chances of being rejected. Ask your mortgage adviser to amend your Agreement in Principle if you want to make an offer that is under what your certificate says. You will be in a stronger position to negotiate if the estate agent doesn’t know how much you can afford.